Does the air coming out of your heat registers seem dusty? With fall and winter on the way, you could go to the store and buy vent filters but why not make them yourself out of all natural materials. The best part is that these filters are washable and can be reused over and over again, and in the unlikely event that they become worn out, you can compost them. 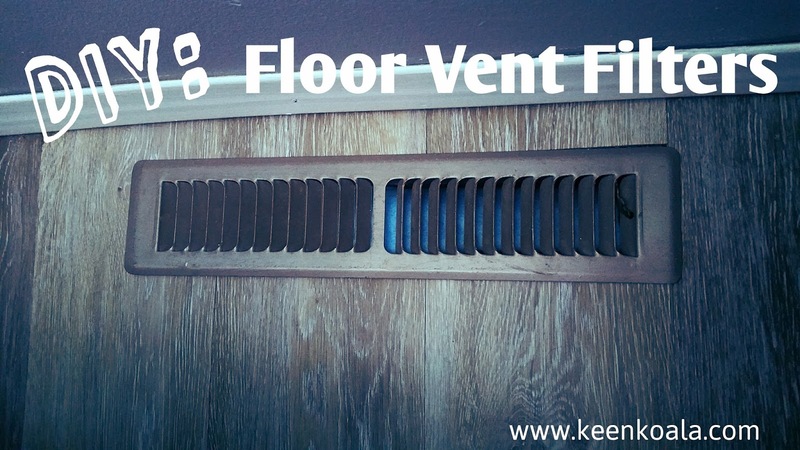 These filters are particularly great if you live in an old house with weird sized vents, where commercial varieties would not even be available to purchase. Please keep in mind that I am just an avid DIY'er and not an HVAC specialist, so please contact one prior to beginning a project like this to make sure that it's safe to do. -Use your hands to stretch the felt until it is a paper-thin webbed layer of felt fibers, about the thickness of a dryer sheet. It is important to get the felt very thin as to not restrict airflow. If you are concerned about airflow restriction, please consult an HVAC specialist for a product suitable for your needs. -Measure how much of this super thin felt you will need to cover the vent holes. - Cut the felt to the appropriate size. - Slide the felt in between the vent hole grate and the closing mechanism. - Trim away any excess felt. - Replace your vent cover. I recommend washing out your dust filter every month or so during the heating season. I like to do this at the same time that I replace my furnace filter. I hope you enjoyed this quick and simple tutorial. For more useful tips and tricks, join us on Facebook by clicking HERE!